An alleged drug trafficker connecting Colombian rebel group FARC to Mexico’s Sinaloa Cartel and drug trafficking organization Los Zetas was arrested in southwest Colombia on Sunday. Hermes Alirio Casanova, dubbed “Megatronic” by the local authorities, was arrested outside a farm in Palmira, a municipality a few miles east of Cali, Colombia’s third largest city. The suspect was one of the few remaining traffickers of a ring led by alleged drug lord Fernain Rodriguez until his arrest late last year. Six of eight suspected members of the ring were arrested in December 2013. “Rodriguez Vazquez and his network have moved massive quantities of drugs for some of the most violent drug trafficking organizations in the Western Hemisphere, including the FARC [Revolutionary Armed Forces of Colombia], Los Zetas and the Sinaloa cartel,” Adam Szubin, director of the United States Office of Foreign Assets Control” said in February, months after six of the alleged eight members of the ring were arrested. According to US authorities, Megatronic’s organization worked together with the FARC to protect cocaine laboratories in rebel strongholds in southwestern Colombia. The drugs that was processed in these labs were then sold to the Zetas and the Sinaloa Cartel and sent to Mexico. More than 100 tons of cocaine were allegedly moved north in order to eventually be sold on the US illicit drug market. 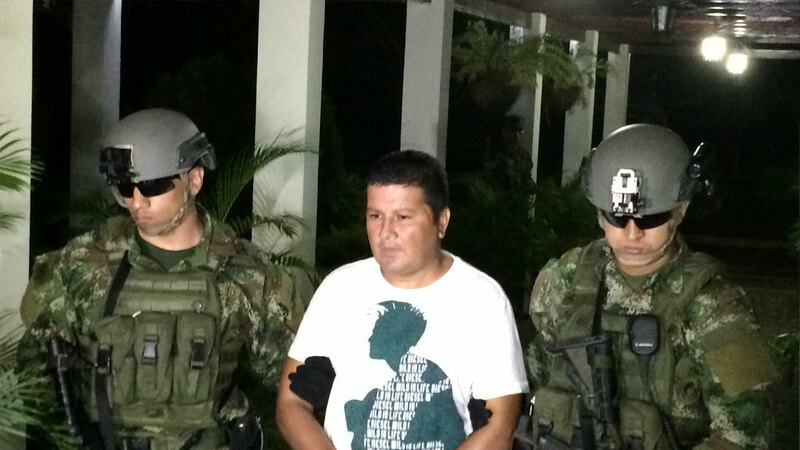 With the arrest of Megatronic, Colombian authorities have captured all but one of the members of the gang accused of being an “important” link between Colombia’s largest rebel group and two of Mexico’s most feared drug cartels. The pursuit and arrest of the alleged narco was recorded by the military and released to the press. The United States had already asked for the extradition of Megatronic who is wanted for drug trafficking charges in both Texas and Florida.